Mom always said to eat your vegetables, so this Mother's Day serve her breakfast in bed inspired by a walk through the garden. We began with the idea of egg-in-a-hat — sometimes called egg-in-a-basket or a Popeye — in which an egg is cracked into a hole cut in the center of a slice of bread. The whole thing is pan-fried, usually just until the white is set and the yolk remains liquid. The idea is that as you eat it, the yolk breaks and soaks the toast with a warm, creamy sauce. Instead of toast, we used the same idea with a bed of vegetables. 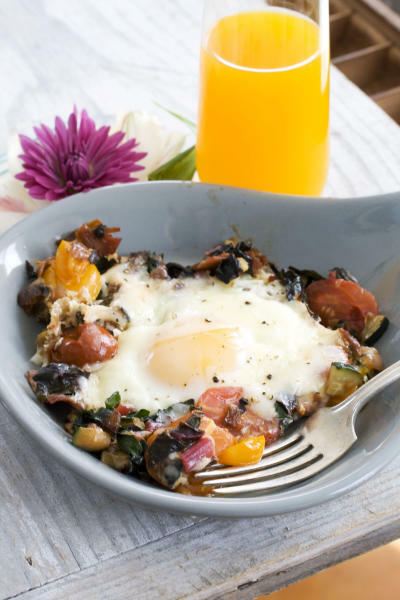 We sauteed a vegetable hash, then nestled eggs into the center of it. To amp the flavor, we also tossed in some prosciutto and cheese. The result is not only beautiful, but also healthy and satisfying. In a large nonstick skillet over medium, heat the olive oil. Add the prosciutto and onion and saute until the onion is tender, about 5 minutes. Add the Swiss chard and zucchini and cook for another 5 to 6 minutes, or until the vegetables are tender and beginning to brown. Add the tomatoes and season with salt and pepper. Stir well, then arrange the vegetables in an even layer. Using a spoon, create 4 wells in the vegetables, each about 2 inches across. Crack an egg into each well. Cover the skillet and cook until just shy of desired doneness, about 3 to 4 minutes. 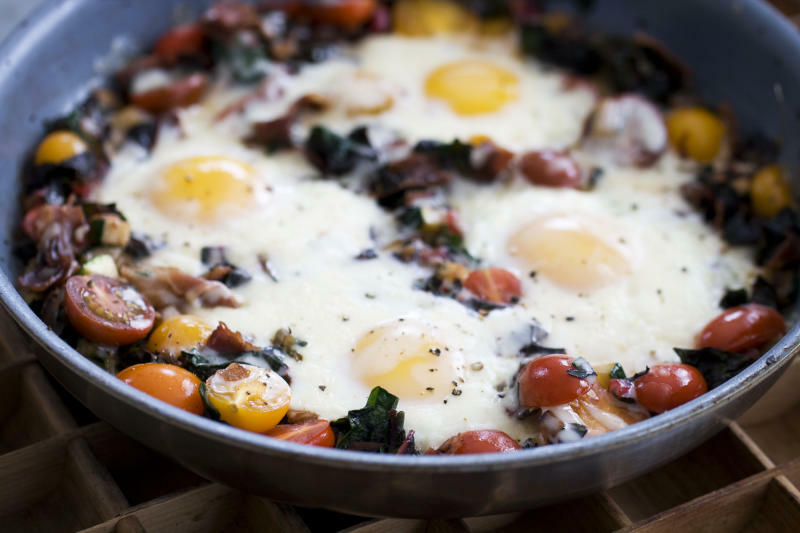 Sprinkle the cheese over the vegetables and eggs, then cover and cook for another minute. 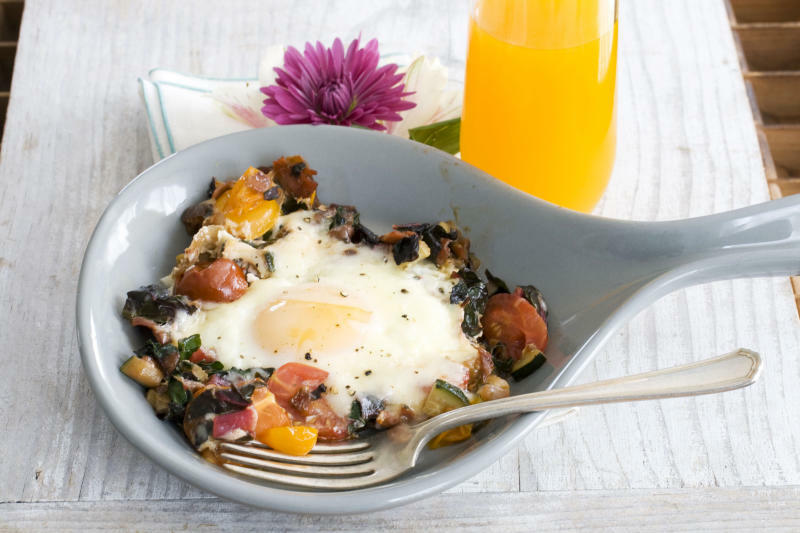 Use a spatula to transfer half of the vegetables and 2 eggs onto each plate. Nutrition information per serving: 380 calories; 220 calories from fat (58 percent of total calories); 25 g fat (9 g saturated; 0 g trans fats); 400 mg cholesterol; 11 g carbohydrate; 2 g fiber; 7 g sugar; 25 g protein; 820 mg sodium.